Not to be confused with Mantsi language. The Mansi language (previously, Vogul and also Maansi) is spoken by the Mansi people in Russia along the Ob River and its tributaries, in the Khanty–Mansi Autonomous Okrug, and Sverdlovsk Oblast. It is one of the Uralic languages, often considered particularly closely related to its neighbor Khanty as well as to Hungarian. According to the 1989 census, there were 3,184 Mansi-speaking people in Russia. The base dialect of the Mansi literary language is the Sosva dialect, a representative of the northern dialect. The discussion below is based on the standard language. Fixed word order is typical in Mansi. Adverbials and participles play an important role in sentence construction. The written language was first published in 1868 and was revised using a form of Cyrillic in 1937. Dialects of Mansi (and Khanty). Mansi is subdivided into four main dialect groups which are to a large degree mutually unintelligible, and therefore best considered four languages. A primary split can be set up between the Southern variety and the remainder. A number of features are also shared between the Western and Eastern varieties, while certain later sound changes have diffused between Eastern and Northern (and are also found in some neighboring dialects of Northern Khanty to the east). 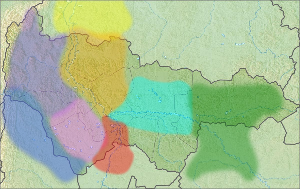 The sub-dialects given above are those which were still spoken in the late 19th and early 20th century and have been documented in linguistic sources on Mansi. Pre-scientific records from the 18th and early 19th centuries exist also of other varieties of Western and Southern Mansi, spoken further west: the Tagil, Tura and Chusovaya dialects of Southern and the Vishera dialect of Western. The two dialects last mentioned were hence spoken on the western slopes of the Urals, where also several early Russian sources document Mansi settlements. Placename evidence has been used to suggest Mansi presence reaching still much further west in earlier times, though this has been criticized as poorly substantiated. Northern Mansi has strong Russian, Komi, Nenets, and Northern Khanty influence, and it forms the base of the literary Mansi language. There is no accusative case; that is, both the nominative and accusative roles are unmarked on the noun. */æ/ and */æː/ have been backed to [a] and [aː]. Western Mansi went extinct ca. 2000. It had strong Russian and Komi influences; dialect differences were also considerable. Long vowels were diphthongized. Eastern Mansi is spoken by 100–200 people. It has Khanty and Tatar influence. There is vowel harmony, and for */æː/ it has [œː], frequently diphthongized. Southern Mansi was recorded from area isolated from the other Mansi varieties. Around 1900 a couple hundred speakers existed; in the 1960s it was spoken only by a few elderly speakers, and it has since then gone extinct. It had strong Tatar influence and displayed several archaisms such as vowel harmony, retention of /y/ (elsewhere merged with */æ/), /tsʲ/ (elsewhere deaffricated to /sʲ/), /æː/ (elsewhere fronted to /aː/ or diphthongized) and /ɑː/ (elsewhere raised to /oː/). /tsʲ/ was only found in Southern Mansi and corresponds to /sʲ/ in the other varieties. /ʃ/ is absent in most dialects of the Northern and Eastern groups, having merged into /s/. The voiceless velar fricatives /x/, /xʷ/ are only found in the Northern group and the Lower Konda dialect of the Eastern group, resulting from spirantization of *k, *kʷ adjacent to original back vowels. According to Honti, a contrast between *w and *ɣʷ can be reconstructed, but this does not surface in any of the attested varieties. The labialization contrast among the velars dates back to Proto-Mansi, but was in several varieties strengthened by labialization of velars adjacent to rounded vowels. In particular, Proto-Mansi *yK → Core Mansi *æKʷ (a form of transphonologization). In 1937, Cyrillic replaced the Latin. The highlighted letters, and Г with the value /ɡ/, are used only in names and loanwords. Mansi is an agglutinating, subject–object–verb (SOV) language. There are two articles in Mansi: definite ань (aɲ), which also means "now" when placed before verbs, and indefinite акв (akʷ), literally "one". There is no grammatical gender. Mansi distinguishes between singular, dual and plural number. Six grammatical cases exist. Possession is expressed using possessive suffixes, for example -зм, which means "my". Missing cases can be expressed using postpositions, such as халнэл (χalnəl, 'of, out of'), саит (sait, 'after, behind'), etc. Mansi conjugation has three persons, three numbers, two tenses, and four moods. Active and passive voices exist. Mansi uses suffixes to express the tense. The tense suffix precedes the personal suffix. The language has no future tense; the future is expressed in other ways. There are four moods: indicative, conditional, imperative and precative. Indicative mood has no suffix. Imperative mood exists only in the second person. Verbs have active and passive voice. Active voice has no suffix; the suffix to express the passive is -ве-. Numbers 1 and 2 also have attributive forms: акв (1) and кит (2); compare with Hungarian két, and Old Hungarian "kit"). ам хул алысьлаӈкве минасум. – I went fishing (literally "I fish catch went"). Here are some invented sentences in Northern Mansi (IPA transcription) and Hungarian. They demonstrate well the relationship between Hungarian and Mansi. ˈxuːrəm neː ˈwitnəl ˈxuːlpəl xus xuːl ˈpuːɣi. Húrem né vitnel húlpel husz húl púgi Három nő a vízből hálóval húsz halat fog. Three women are catching twenty fish with a net from the water. ˈxuːrəm-saːt-xus ˈxulax-sam ˈampəm ˈwitn̩ ˈoːli Húrem-szát-husz hulah-szam ampem viten óli Háromszázhúsz holló szemű ebem vízen él. The three hundred and twenty dogs of mine with raven eyes live on water. luː ˈlaːɕal ˈmini toː ˈseːln̩ Lú lásal mini tó szélen Ló lassan megy a tó szélén. A horse is slowly walking on the side of the lake. ^ Hammarström, Harald; Forkel, Robert; Haspelmath, Martin, eds. (2017). "Northern Mansi". Glottolog 3.0. Jena, Germany: Max Planck Institute for the Science of Human History. ^ Honti 1998, pp. 327–328. ^ Gulya, Janos (1958). "Egy 1736-ból származó manysi nyelvemlék". Nyelvtudományi Közlemények (60): 41–45. ^ Kannisto, Artturi (1918). "Ein Wörterverzeichnis eines ausgestorbenen wogulischen Dialektes in den Papieren M. A. Castréns". Suomalais-Ugrilaisen Seuran Aikakauskira (30/8). ^ Kannisto, Artturi (1927). "Über die früheren Wohngebiete der Wogulen". Finnisch-Ugrische Forschungen (XVIII): 57–89. ^ Napolskikh, Vladimir V. (2002). ""Ugro-Samoyeds" in Eastern Europe?". Finnisch-Ugrische Mitteilungen (24/25): 127–148. ^ a b Kálmán 1965, pp. 4–5. ^ a b Honti 1998, p. 335. ^ Grenoble, Lenore A (2003). Language Policy in the Soviet Union. Springer. p. 14. ISBN 978-1-4020-1298-3. ^ *lat. : With Latin script. Honti, László (1998). "ObUgrian". In Abondolo, Daniel (ed.). The Uralic Languages. Kálmán, Béla (1965). Vogul Chrestomathy. Indiana University Publications. Uralic and Altaic Series. 46. The Hague: Mouton. Kulonen, Ulla-Maija (2007). Itämansin kielioppi ja tekstejä. Apuneuvoja suomalais-ugrilaisten kielten opintoja varten (in Finnish). XV. Helsinki: Suomalais-Ugrilainen Seura. ISBN 978-952-5150-87-2.